Lose the crossbow, katana, hammer and even the guns, because when the dead reanimate with an appetite for human flesh, survival just might rely on a good dentist. Enter Nicholas Toscano, DDS, Manhattan's zombie dentist. Visitors to Toscano's Manhattan Periodontal Associates in midtown know him more as a celebrity dentist regularly featured in OK Magazine and In Touch Weekly. Through his work, he treats actors, newscasters, reality stars and real housewives - and has treated notable politicians such as Hillary Clinton. But Toscano, is also a die-hard follower of the zombie genre, specifically AMC's The Walking Dead. We see zombies chomping down on humans fairly easily, but are our jaws able to do that? If you watch The Walking Dead, you see them literally ripping apart muscle and bone, but let's talk about life for a second. In your jaw, you have enough power in your muscles to crack nuts. There are people that chew on ice or literally chew on nails because they have so much power in their bite. And the enamel on your teeth is the hardest bone in your body. Teeth are actually harder than bone. Would it take a long time to tear into and rip off a hunk of flesh from a healthy human trying to get away? Not really. If you bit my arm right now, you could probably take a big chunk out of it before I could stop you. Like you mentioned [before the interview began] Mike Tyson bit off Evander Holyfield's ear. That's cartilage but what's on the arm? It's just really flesh and muscle. You could bite a big chunk. And the neck is really just soft tissue and not much different from the ear. You could bite the neck, rip out the artery and it wouldn't be too difficult. Then what separates a human's ability to bite from a theoretical zombie? In life, people have nerves, they feel pain. The teeth sit in the jaw bone in this periodontal ligament that acts as a suction cup. That keeps the tooth anchored in the bone, and it has nerve fibers. Those nerve fibers send impulses to the brain and tells the brain how much force the teeth can use without having pain. When it starts to develop pain, it starts to back off. Then we don't chew as hard or we get a twinge of sensitivity. A zombie doesn't have any pain receptors; they don't feel pain. They don't have nerves, they don't have feeling anymore. So they can go ahead and bite with an incredible amount of force and pull that flesh off the bone without any sensation of pain. They actually have a much stronger bite force than what a live human being does. So they are just going to keep biting despite whatever damage they might be doing to their bodies, because that pain isn't stopping them? Right. They'll break their jaw in half trying to chew off the flesh. You'll see zombies where part of their jaws might be hanging out; maybe that zombie bit off more than he could literally chew. But as is, even a normal human bite could be devastating. Like I said, you could bite my arm now and tear off a big chunk of flesh without causing too much pain to yourself. But these are dead creatures. Wouldn't there be decay in a zombie's teeth? What's the last thing to go? The flesh rots off but you go back, dig up a mummy or fossils and find teeth. Dinosaurs have been in the earth millions and millions of years, but the bones and teeth are still there. The last thing to decay on a human is bone. But bacteria is still around. They're not brushing their teeth! Teeth will break apart in time, and The Walking Dead shows zombies with broken teeth. But in general, a zombie's teeth could be healthy. There are people who don't brush their teeth but they don't get decay. When I was in dental and medical school, we had human skulls in our hands that had a full set of 32 teeth, undecayed. 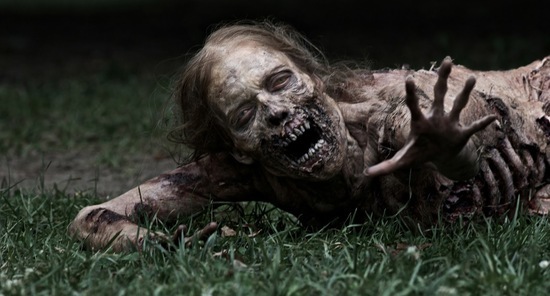 When a human dies, the dental care stops but so does the eating - except zombies keep eating and don't floss or brush. On average, how long could those zombie teeth sustain that kind of pressure and use? Probably not long, realistically. It could be a year, or maybe a little better. 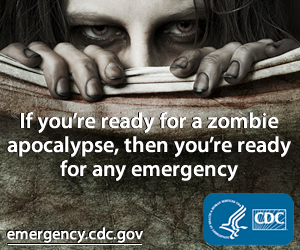 It depends on how fast those zombies decay. What would be your plan against zombies then? Just knock them in those rotted teeth? Look at what the character Michonne does on the show. I like that. She takes off the jaw and makes them relatively harmless. They don't try to choke you or hurt you in any other way besides biting. Once their jaw is gone, they really have no other way of hurting you. Take off the jaw. If you tried to punch through those teeth, they could potentially be brittle at that point. But for instance, when survivors step on the zombie heads and crush their skulls on the show, that's not so easy to do. A skull is a pretty hard object. But if zombie bones get brittle, soft and mushy, maybe it wouldn't be hard. But I don't want to test punching a zombie's teeth. How could a zombie apocalypse survivor maintain his teeth? They raid stores and have access to toothpaste, toothbrushes, floss. So they have supplies. But if that was not the scenario, some alternatives would be gargling with salt water, trying to kill as much bacteria as possible. Using cotton balls to clean the plaque off your teeth would help. Any type of antiseptic, you could rinse with, like hydrogen peroxide. If they have an abscess, they might have to go the Tom Hanks route from Castaway. He was on an island by himself, didn't have access to care and was pulling out his own teeth because they were rotting. What survivor on the The Walking Dead would you want to treat? Daryl Dixon, for sure. Norman Reedus plays him great, and Daryl has the best chance of surviving the zombie apocalypse. He is a skilled hunter, tracker and can survive with something other than a gun, which is noisy and requires bullets. So he deserves the best dental care. Some fans say if Daryl dies, we riot. I say if Daryl dies, it will bite. Say a zombie wants to eat your Braaaaains. Could it bite through the skull? Is it even possible?